Then, it dawned on me that one of the techniques in the posture that nearly every teacher (including myself) uses was totally irrational. 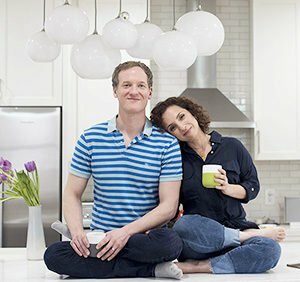 The problem—for my body and many others—was forcing the pelvis to stay positioned directly over the knees. To say this another way, the cascade of problems stemmed from keeping the legs vertical and stacking the hips directly over the knees. I think I’m pretty good at teaching yoga. But, I also think I get lazy once in a while and I don’t expose students to the world of backward bending that exist beyond Urdhva Dhanurasana. I regularly teach a couple of prone backbends, some bridge pose variations, then conclude the backward bending series with Urdhva Dhanurasana. That’s it. Time and time again. So, I’ve turned over a new leaf. We’re going beyond Urdhva Dhanurasana in all of my experienced-level classes. 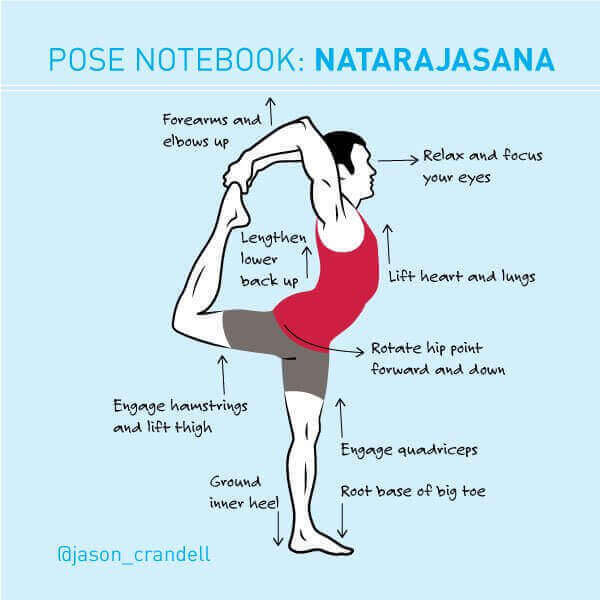 And, the first pose to tackle in this progression is Eka Pada Urdhva Dhanurasana. If you have a reasonable degree of proficiency in Urdhva Dhanurasana, you can start working on lifting one of your legs for Eka Pada Urdhva Dhanurasana. It’s literally one step away. But, this step introduces a ton of instability into the posture, so there a few things I like to do in order to make the posture accessible—and less likely to make your SI and lower-back feel tweaky. First, Eka Pada Urdhva Dhanurasana is referred to as an asymmetrical backbend. There’s an essential component of alignment in asymmetrical backbends that applies to this one, too. Ready? It’s essential that only part of your body that is asymmetrical are your legs. You do NOT want your hips to be asymmetrical or your spine to be asymmetrical. Your top leg is flexing and your bottom leg is extending. The pelvis, however, needs to stay level and your spine needs to backbend without any twisting motion. Rotating your spine while doing a deep backbend may over stress your lower-back. There are a couple of ways to keep your hips level in Eka Pada Urdhva Dhanurasana. First, the leg that stays connected to the floor has to work much harder. Obvious, right? In particular, the abductors and the gluteus maximus on the standing leg need to work like mad. Without intense engagement in these muscles, your opposite hip (the side of the lifted leg) will drop slightly toward the floor. If this hip drops, the pelvis and spine will rotate. Not good. Also, be mindful that engaging your glutes and outer hip muscles may externally rotate and abduct your bottom leg. I don’t actually have a problem with this, since it’s preferable to the opposite hip collapsing. But, if you don’t like the feel of it, you can also hug your leg toward the midline by engaging your adductors. Committing to strongly reaching your top leg toward the ceiling also helps keep the pelvis level. You can’t phone in this pose. You’ve got to reach the top leg full barrel. 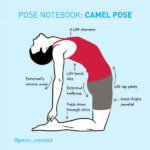 To do this, I like to pull my lifted knee toward my chest as strongly as I can. Then, I reach my top heel toward the ceiling. I find that flexing the top foot instead of pointing my top foot gives me more levity and height in the posture. There are two more details that help me with Eka Pada Urdhva Dhanurasana. First, I step my feet a little closer to each other before lifting my leg. Second, I place my hands wider apart than I do for Urdhva Dhanurasana by about six inches. Think about it this way. In regular Urdhva Dhanurasana, you have a rectangular base. When you lift one foot off the ground for Eka Pada Urdhva Dhanurasana, you have a triangular base. In order to make the triangular base of Eka Pada Urdhva Dhanurasana more stable, it’s helpful to broaden the arms and center the remaining foot. This provides more stability in the posture, which allows for greater range of motion. 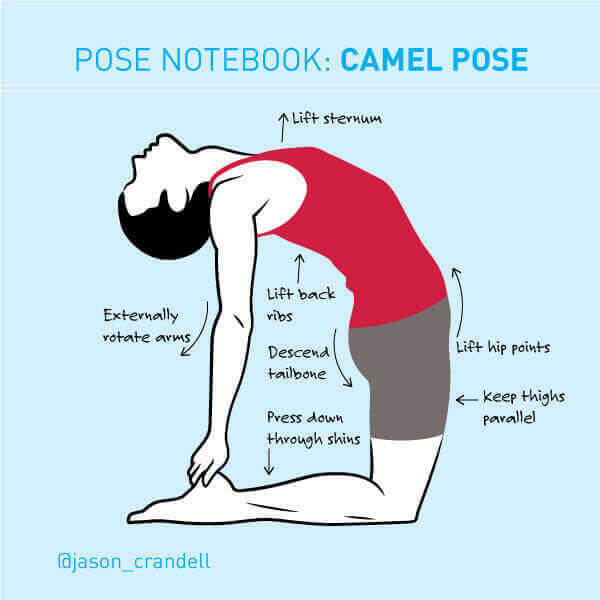 Give these steps a try and see how the pose feels in your body. Of course, your practice isn’t just about doing harder things like Eka Pada Urdhva Dhanurasana. It’s also about continuing to learn and grow. And, even if you can’t do this variation, practicing it a time or two will make the regular version of Urdhva Dhanurasana feel like a piece of cake. I’ve been easier, softer and lighter on my hips for the last couple of years. I used to bludgeon them with intense leverage and long holds, thinking that I was creating more flexibility. 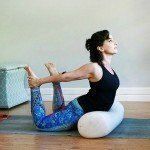 I finally came to terms with the reality that this approach usually left my hips feeling achy, sore, and stiff for a couple of days. After nearly two decades, I’ve changed my tactics. I still stretch my hips and I still hold postures for a reasonable duration. 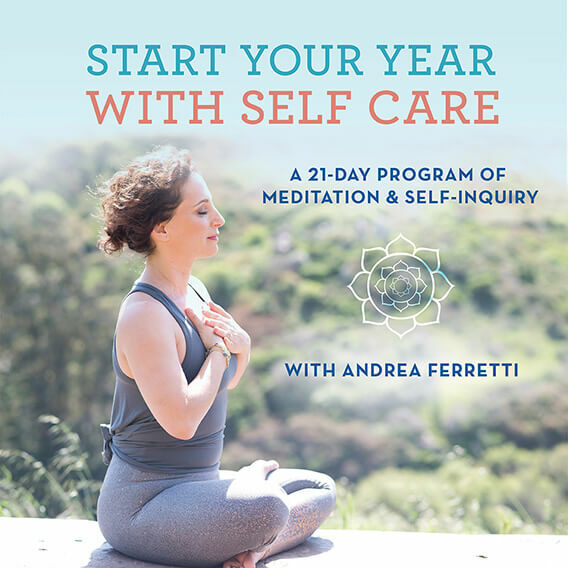 I still practice lunges like Anjaneyasana (Low Lunge), Crescent (High Lunge), Pigeon Pose, and Lizard—the topic of this instructional. I still love “hip-openers,” and I teach them regularly. Of course, I balance this approach more skillfully than I have in the past by including more strengthening work for my hips. But, also, I treat my hips like the dynamic joint they are when I do “opening” postures. Instead of staying for long periods in the same pose, I do several repetitions of the same posture. For example, instead of staying in Pigeon for 3 minutes, I might do 3 or 4 versions of Pigeon for approximately 1 minute each. Instead of loading all my weight onto my hips during deep lunges, I often use my arms actively so they take some of my weight instead of letting it all go into my hips. 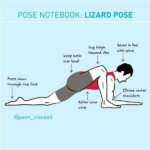 Lizard Pose is perfect for this approach. 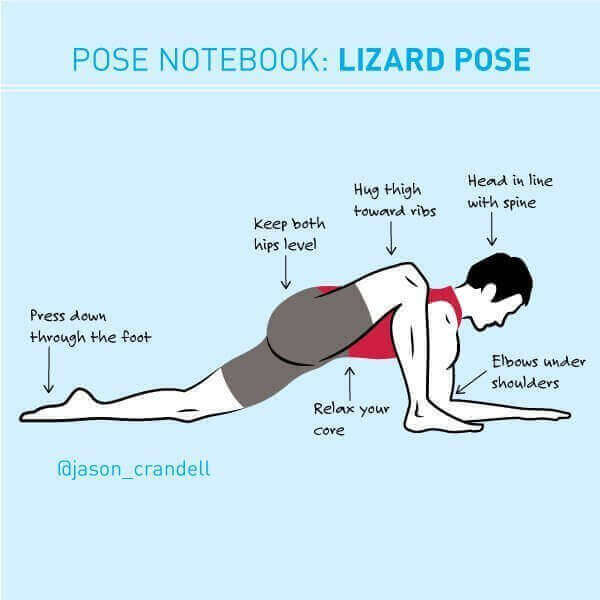 When you look at the illustration of me in Lizard above, you’ll see two important details that will keep you lighter: My elbows are on the floor directly under the shoulders and my front shin is vertical. Try it this way—instead of sinking all of your weight into your hips, press your forearms and front foot down into the floor to lighten the load on your hips. If you’re a little less flexible, put a block or two under your elbows. You’ll still get plenty of stretch in your hips, but these actions will slighty lessen the intensity. I’ve come to believe this is a good thing. If you want more intensity, add a few more repetitions. Experiment with this approach to stretching your hips and see if having a lighter touch is helpful to you. Let me know how it goes in the comments section. Enjoy.